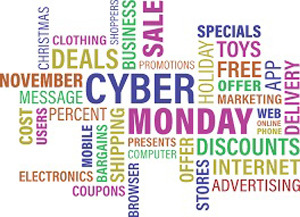 The next upcoming Cyber Monday is on Monday December 2, 2019. Cyber Monday falls as the first Monday after Thanksgiving and the first Monday after Black Friday. This day is a day that Americans go back to work and buy things on their computer thus Cyber Monday. Most of the major online retailers have their biggest discounts offered on this day. People go to work and take advantage of the holiday sales online while their working because they cannot physically go to the shopping malls. To get as many people as possible shopping, many online retailers will offer their best sales prices on this day. Since the huge growth of online sales over the past 20 years this day has become the largest single day of the year with online sales. Year over year sales growth continues to grow each year.